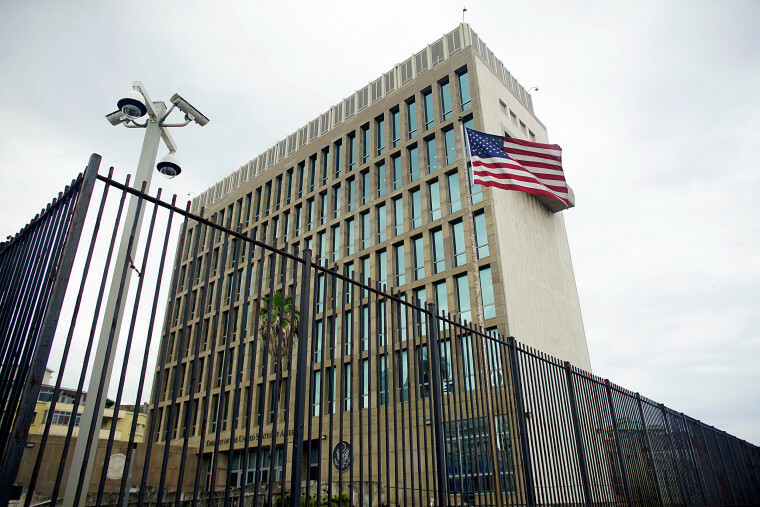 WASHINGTON — At least 16 U.S. government employees or their family members in Cuba have experienced symptoms, including hearing damage, that have required medical attention, the State Department confirmed Thursday. "We take this situation very seriously," State Department Spokesperson Heather Nauert said Thursday. "We are trying to provide them the help, the medical help, the medical care and treatment that they need and the support that they deserve." This was the first time the agency has spoken publicly about the number of those affected by the what officials are describing as "incidents" that began late last year. What caused the health symptoms for the 16 Americans is still unknown. U.S. intelligence officials say a range of possibilities is being considered, based on the reported symptoms, and it’s not clear whether ultrasonic sound waves were to blame. It could also have been radio waves or even attempted poisoning, one official has said. "This is unprecedented," Nauert had said Wednesday. "We have not seen this type of activity take place before." A multi-agency U.S. investigation is ongoing and as of Thursday the U.S. is still not assigning blame. State Department Diplomatic Security, which is responsible for the security of American personnel, U.S. intelligence agencies and other government agencies with expertise about potential causes are all involved. A senior State Department official said the Cuban government has been responsive. Cuban officials have denied directing any actions against the U.S. government employees and have launched their own investigation into the incidents. The U.S. has left open the possibility of a third country's involvement. A senior State Department official confirmed that the "incidents" stopped this spring although some people may still be experiencing symptoms which have manifested differently in different individuals. Nauert said Thursday the U.S. has determined the incidents had ceased through conversations with the affected employees and medical personnel but nothing, such as a piece of equipment, has yet been identified as the source or the cause. Publicly, the State Department has said only that the Americans returned home with "physical issues." One State Department official confirmed reports that the diplomats were experiencing symptoms of hearing loss, and a Cuban government official told NBC News the Americans had complained of an acoustic "incident." Some of the U.S. government employees were medically evacuated to Miami, Florida, to receive medical treatment and testing. For others who chose to stay in Cuba, medical professionals were brought to that country to treat and test those affected. A senior State Department Official said the department was in close contact with the U.S. employees in Havana and described many meetings where the charge d’affaires heading the embassy gathered staff to compare notes. "These are US government employees that we're talking about," Nauert said Wednesday. "What has happened there is of great concern to the US government, the State Department, the White House, other agencies and departments involved as well."